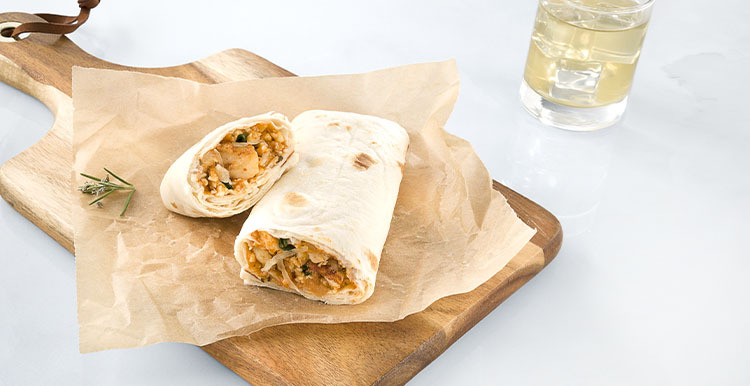 Tender chicken in a tasty red tomato, chipotle pepper and tomatillo sauce topped with cheeses and cilantro then all wrapped up in a tortilla for a warm hand-held lunch that's so good you won't put it down till it's gone. Ingredients: FILLING (CHARBROILED WHITE MEAT CHICKEN [COOKED CHICKEN WHITE MEAT, WATER, MODIFIED POTATO STARCH, SALT, SODIUM PHOSPHATE], MONTEREY JACK CHEESE [CULTURED MILK, SALT, ENZYMES], LOW MOISTURE PART-SKIM MOZZARELLA CHEESE [MILK, NONFAT MILK, CULTURES, SALT, ENZYMES], TOMATILLOS, GROUND TOMATOES, TOMATO PUREE, WATER, YELLOW ONIONS, MODIFIED FOOD STARCH, SPICES, CILANTRO, CANOLA OIL, GRANULATED GARLIC, MODIFIED CELLULOSE, CHIPOTLE PEPPER PUREE [CHIPOTLE PEPPERS, WATER, SALT, VINEGAR], SALT, VINEGAR, CITRIC ACID, NATURAL FLAVOR, NATURAL SMOKE FLAVOR, GARLIC, POTASSIUM SORBATE AND SODIUM BENZOATE [PRESERVATIVES]), TORTILLA (ENRICHED WHEAT FLOUR [BLEACHED WHEAT FLOUR, NIACIN, REDUCED IRON, THIAMINE MONONITRATE, RIBOFLAVIN, FOLIC ACID], WATER, MODIFIED WHEAT STARCH, CANOLA OIL, GLYCERIN, BAKING POWDER [SODIUM ACID PYROPHOSPHATE, BICARBONATE SODA, CORN STARCH, MONOCALCIUM PHOSPHATE], SUGAR, MODIFIED CELLULOSE, SALT, CELLULOSE GUM, DOUGH CONDITIONER [CALCIUM SULFATE, L-CYSTEINE HYDROCHLORIDE, ASCORBIC ACID]). Nutrients: FILLING (CHARBROILED WHITE MEAT CHICKEN [COOKED CHICKEN WHITE MEAT, WATER, MODIFIED POTATO STARCH, SALT, SODIUM PHOSPHATE], MONTEREY JACK CHEESE [CULTURED MILK, SALT, ENZYMES], LOW MOISTURE PART-SKIM MOZZARELLA CHEESE [MILK, NONFAT MILK, CULTURES, SALT, ENZYMES], TOMATILLOS, GROUND TOMATOES, TOMATO PUREE, WATER, YELLOW ONIONS, MODIFIED FOOD STARCH, SPICES, CILANTRO, CANOLA OIL, GRANULATED GARLIC, MODIFIED CELLULOSE, CHIPOTLE PEPPER PUREE [CHIPOTLE PEPPERS, WATER, SALT, VINEGAR], SALT, VINEGAR, CITRIC ACID, NATURAL FLAVOR, NATURAL SMOKE FLAVOR, GARLIC, POTASSIUM SORBATE AND SODIUM BENZOATE [PRESERVATIVES]), TORTILLA (ENRICHED WHEAT FLOUR [BLEACHED WHEAT FLOUR, NIACIN, REDUCED IRON, THIAMINE MONONITRATE, RIBOFLAVIN, FOLIC ACID], WATER, MODIFIED WHEAT STARCH, CANOLA OIL, GLYCERIN, BAKING POWDER [SODIUM ACID PYROPHOSPHATE, BICARBONATE SODA, CORN STARCH, MONOCALCIUM PHOSPHATE], SUGAR, MODIFIED CELLULOSE, SALT, CELLULOSE GUM, DOUGH CONDITIONER [CALCIUM SULFATE, L-CYSTEINE HYDROCHLORIDE, ASCORBIC ACID]).